The use of third party suppliers is ubiquitous. In today’s digital world the Internet and, more recently, the Cloud have created larger marketplaces where businesses of all sizes can compete globally and offer services using a number of commercial models such as pay per use, e.g. Software-as-a-Service (SaaS). In some cases organisations may find that the service they purchase, or at least a subset of it, is actually delivered by another third party contracted directly by the prime supplier. In most cases this is an acceptable supplier model to use, but the organisation consuming the service may at least want to know of the sub-contracting supplier’s existence, especially if the service is visible in the public domain. Service Consumer – an organisation purchasing a product consisting of one or many services (either Business, Application or Infrastructure). Prime Service Provider – an organisation that sells a product to a Service Consumer. This product provides the entitlement to consume specific services. Sub-Contractor – a third party that holds a contract with the Prime Service Provider to deliver a service that forms part of the overall service consumed. Edifit has worked with a number of clients where there is a need to understand which components of the overall service are delivered by third parties, be they Prime or Sub-Contractors. We’ve found that in some cases a supplier may be the prime provider for one service and the sub-contractor for another service. We help organisations understand the services provided by their suppliers and the impact of changing a contract or the services in scope. We also enable insight by joining disconnected datasets without changing the accountabilities for delivery. The diagram below is an example of how we often recommend modelling these concepts and their relationships. 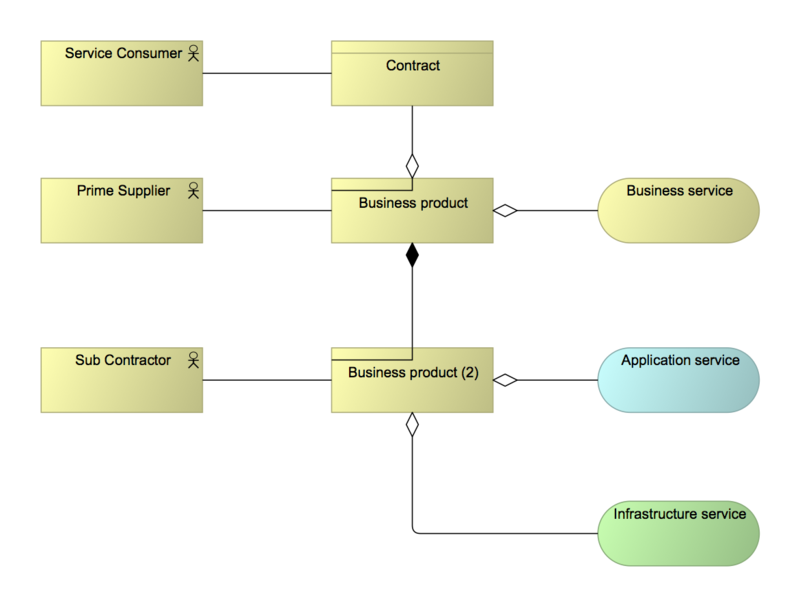 This model enables our clients to calculate which services are supplied by the prime contractor directly, and which are provided by their sub-contractors. Edifit has a wealth of experience of Enterprise Architecture modelling and we are passionate about delivering insight by simplifying the complex relationships that exist cross-domain (Business and IT). If you too would like some assistance please contact us and we’ll be glad to help. Stay tuned for our next blog where we’ll focus on Edifit’s recommended approach to managing our supplier model.